Things have changed quickly in the last week or two! 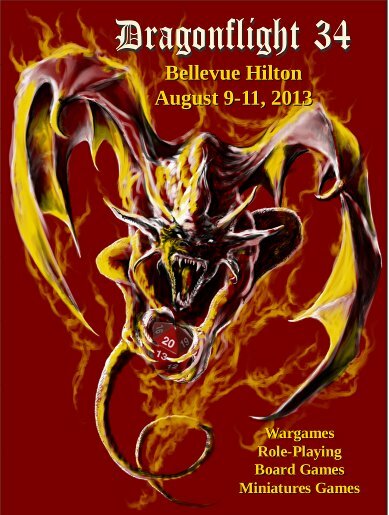 Edmund and I are now scheduled to attend at least three game conventions this year. Today’s topic is “Neighbours.” This is the queue early in the morning in Seattle, when homeless people wait for the day centre to open so they can warm and dry themselves, sit somewhere other than the cold ground or a park bench from which they will be evicted, get a cup of coffee, and maybe get some other help. I saw them every morning from the bus on my commute to work, not to mention my noon-time walks around the neighbourhood. Some were friendly familiar faces, many were closed and looking inward, and many more made me sad because I could not give the kind of help they wanted. 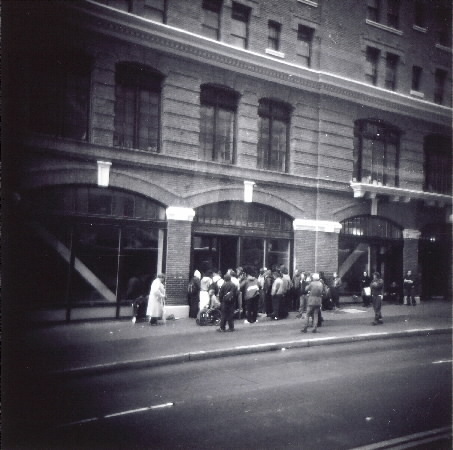 The photo was taken with my trusty Holga toy camera. Image by Sophie Lagacé 2005, licensed under CC BY-NC-SA 3.0. 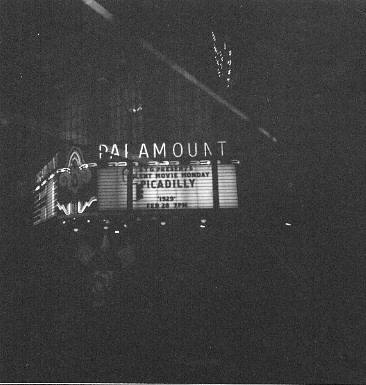 Today’s topic is “Sign.” This is the marquee sign of the Paramount Theatre in Seattle, seen through the bus window as I passed it on my way back from work on a winter night. 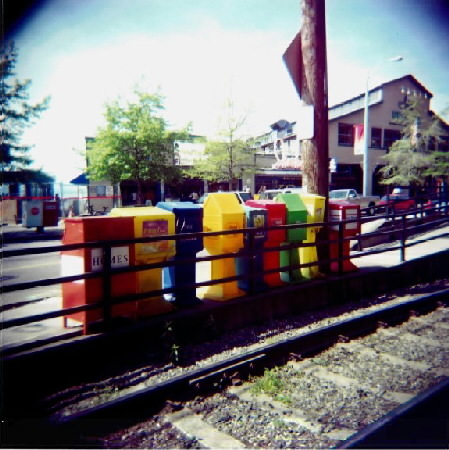 Today’s topic is “Good News.” How could I resist this image I took of newspaper boxes at the railcar stop along the Seattle Waterfront, near the Seattle Aquarium? 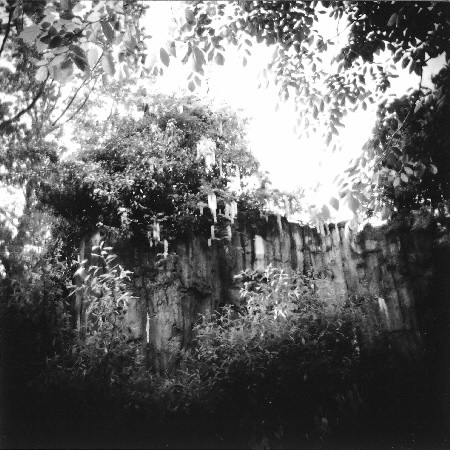 Today’s topic is “Free.” This is a picture of one of the habitats at Woodland Park Zoo in Seattle, the nicest zoo I have ever visited. The habitats are created to be as natural as possible and give lots of space to the animals, and there is a strong emphasis on conservation, science, and education rather than just gawking for entertainment. But I wanted to use this to make a little comment on a cherished Christian concept, “free will.” When I was Catholic, I held on passionately to the concept of free will because it’s the closest theologians have ever come to answering the problem of theodicy, or why evil exists, while preserving the notions of a deity who is all-powerful, all-knowing, completely good, and loving. Unfortunately, it doesn’t really stand up to scrutiny. The good news is that once you let go of the shopping list of concepts you wish to hold on to and prop up with the help of “free will”, it really doesn’t matter. Free will is not a useful concept in this form once religion is taken out of the equation; instead, responsibility, information, and context now matter. 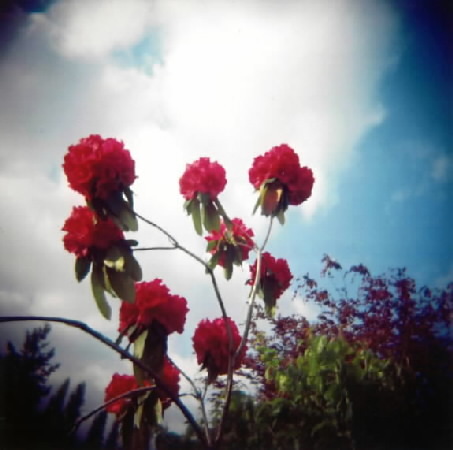 Today’s topic is “Rejoice.” I find the red rhododendron blooms against the blue sky something to rejoice about. Today’s topic is “Hope.” Doesn’t that gull look hopeful for French fries? 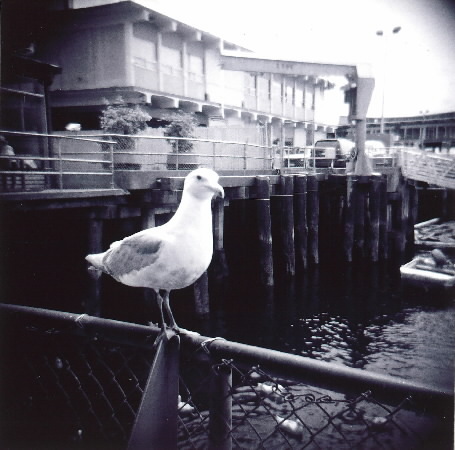 The photo is taken at Ivar’s along the waterfront in Seattle, with my trusty Holga toy camera. 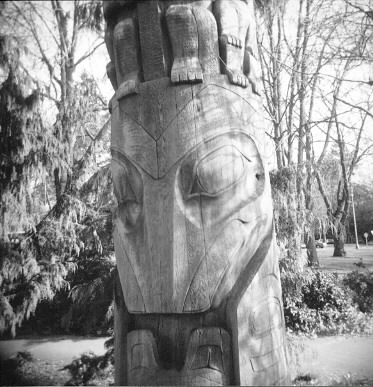 Today’s topic is “Steadfast.” I can’t think of anything that evokes steadfastness better than the totem poles carved and raised by Pacific Northwest native peoples, from Salish tribes of the Puget Sound and Georgia Strait area to the Nuu-chah-nulth and Kwakwaka’wakw wonders of Vancouver Island, to the Haida of the Queen Charlotte Islands, a.k.a. Haida Gwai, to the Tsimshian, and Tlingit guardians of the coast of British Columbia and Alaska. 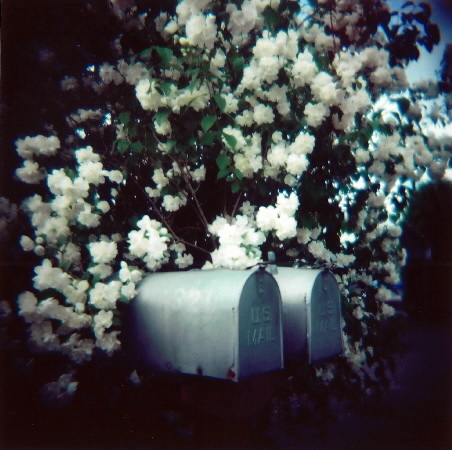 Today’s topic is “Delight.” I take my delight in a lot of small daily things, and one of them when I lived in Seattle was walking by my neighbours’ climbing roses in bloom on my way to and from the bus stop for my work commute. It had such a lovely dream-like old-timey quality to it. .PDF: As an addendum indicating changes, from Issuu or Google Drive. If you don’t already have the PDF program, here it is from Issuu or Google Drive. Note that Issuu allows you to browse online, magazine-style, and to download as PDF by clicking “Share”, then “Download”. .ePub: (For Nook, Kobo, Sony Reader, etc.) As a zipped ebook of the full, updated program, including the cover and metadata. Just unzip and add to your library. Download from Google Drive. .mobi: (For Kindle) As a zipped ebook of the full, updated program, including the cover and metadata. Just unzip and add to your library. Download from Google Drive.